A significant number of plants rely on birds to act as dispersal agents for their seeds. As an incentive, the plants often offer nutritious fleshy fruits to attract birds to take the seeds, hidden inside, and ingest them. The seeds have tough external coats that protect them from the digestive systems of birds, allowing them to be deposited elsewhere once they have passed through the bird’s gut. This apparently mutualistic arrangement (birds acting as dispersers and plants devoting resources to offering energetic rewards) is complicated by the fact that some birds eat the pulp and discard the seed (pulp-predators) or eat and digest the seed (seed-predators). Regardless of such considerations, there is plenty of evidence in the scientific literature to highlight those plants that are particularly valuable to birds as a source of fruits, berries or seeds (for ease of reading we will refer collectively to fruits, berries and arils as fruits). after more popular fruits are exhausted. Holly, in particular, has a long fruiting season. The first berries become available during September and the long-lasting fruits may remain on the tree through until the following July. 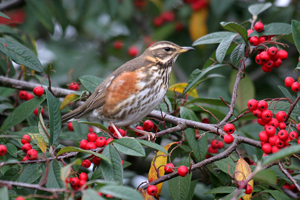 Although one reason for this is the durability of the fruits, another is the fact that many Holly trees are defended by Mistle Thrushes, which prevents other birds from feeding on the fruits. Fruiting season can vary across even closely-related plants. While Sorbus aria ripens in September, Sorbus torminalis ripens in November and Sorbus aucuparia ripens from late July. However, it is worth noting that Sorbus aucuparia has a more northerly range than the other two species and that plants in the northerly part of their British range tend to have fruit that ripens earlier than seen in their southern counterparts. The nutritional characteristics of fruits may also vary with season, notably with water content of the pulp declining and average lipid content increasing as the season progresses. When metabolised, lipids produce more energy (per gram of dry weight) than either protein or carbohydrates, the two other main nutritive components of the pulp. Such differences may be related to the birds’ needs; the plants effectively competing for seed dispersers and needing to have fruits that are as attractive as possible in order to secure dispersal. Individual bird species feeding on fruits will select those that offer the greatest returns for the effort spent in securing them. This may be influenced by the energy content of the fruits, their relative availability and ease of access. There is even evidence that birds actively select fruits with a high anthocyanin content. As well as being important pigments in ripe fruits, anthocyanins are well-known anti-oxidants. Fruits rich in anthocyanins are black or ultraviolet reflecting (birds can see better in the UV spectrum than us). If plants use these anthocyanin pigments as an honest signal of the nutritional rewards on offer, then birds should preferentially select them. Of course, not all the birds are after the nutritious pulp; others may be after the seeds themselves. Plants may seek to counter these avian cheats through the incorporation of toxic compounds into the seed coat or its lining. There is thus an evolutionary arms race in operation, with different factors coming into play, some seeking to attract particular seed dispersers, others seeking to prevent the actions of seed predators. Want to know which trees and shrubs to plant for berries?